The Green Climate Fund (GCF) approved on Sunday a $31.4 million United Nations Development Programme (UNDP) project to protect Egypt's Nile Delta from rising sea levels due to climate change, the UNDP said in a press statement. The project titled “Enhancing Climate Change Adaptation in the North Coast of Egypt” will be implemented by the Egyptian Ministry of Water Resources and Irrigation over seven years. The GCF is a global fund that offers support to developing countries to deal with the challenge of climate change. The approval for the project came during the GCF's 18th board meeting in Cairo from Saturday to Monday. Egypt's irrigation ministry will contribute EGP 140 million to the project, which is centred around the construction of dikes to prevent flooding of homes and farmland due to rising sea levels and extreme weather due to climate change. "The project aims to protect the densely populated low-lying lands in the Nile Delta, the home of 25 percent of the Egyptian population, which have been identified as highly vulnerable to climate change induced Sea-Level Rise (SLR)," read the UNDP press statement. The irrigation ministry said that the project is the biggest grant Egypt has obtained from the GCF to help adapt to climate change, according to Al-Ahram Arabic. "The project will also support the development of an Integrated Coastal Zone Management Plan (ICZM) for the North Coast of Egypt that links the plan for shore protection from SLR with the national development plan of the coastal zones," the UNDP added. Some scientists have predicted that Egypt will suffer environmental calamities as a result of climate change, with the Nile Delta particularly at risk from flooding by the Mediterranean Sea. 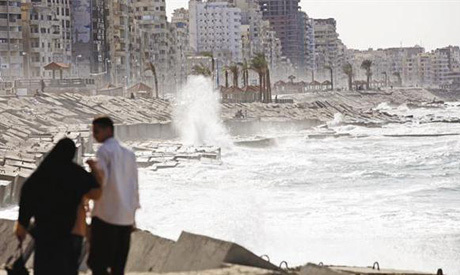 According to the UNDP, rising sea levels will have a critical impact on Egypt’s infrastructure and development along the low-lying coastal areas, eventually having an impact on Egypt’s entire economy.